There are so many wonderful customs attached to the Celtic season, that period before Saint Patrick’s Day in which we actually choose to honor and celebrate March 17th, (a number normally somewhere between 30 and 363 days, not including March 18th, as it is recognized as the national day of recovery for the hardiest of celebrants). But of all that is sacred to the Celtic tradition, there is nothing more beautiful than the wearing of the kilt. The history of the garment dates back to at least 16th century Scotland. The original tartan weaves and colors signified regional associations. The practice of identifying individual clans by way of a registered design only began in the 19th century. Also during that period the donning of the kilt was taken up by the rest of the Celtic enclave. The Cornish, Irish, Welsh and Manx put on the plaid. The kilt allows one to get in touch with the more sensitive aspects of manhood, while still being able to maintain our barbaric tendencies. As a species we are always caught between the skirt and the Sgian Dubh (pronounced Skean Du). Literally translated, it refers to the Black Knife tucked into the sock of a kilt wearer. 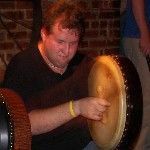 When he is not performing at a local Ceili, musician and contributing editor to American Public House Review, Matt Deblass loves to sport his kilt at Porter’s Pub in Easton, Pennsylvania. 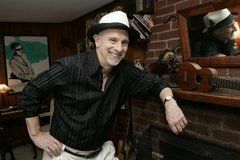 You can enjoy him and other Celtic artists by clicking onto the jukebox section of our magazine. In order to help you take your mind off soaring gasoline prices, a bad economy, terrorism and the state of American politics, we are pleased to feature tunes from a couple of fine musicians that appeared in the January issue of American Public House Review. We hope you enjoy the music of Grover Kemble and Matt DeBlass.